The borough of Belmar in New Jersey is situated in Monmouth County. Belmar is a community known for its small-town appeal, rural charm, and an abundant community life. This borough has a profusion of recreational activities that are relished by residents and tourists alike. Belmar’s boardwalk and beaches are open year-round for the enjoyment of the community. During the summer, swimming, surfing, fishing, kayaking, and boogie boarding are a main stay. The mile long boardwalk in Belmar offers unbelievable panoramic views of the Atlantic Ocean. Voted number four in 2017 in New Jersey, Belmar Beach is the best of the best. In 2015 many amenities were added to this popular attraction. These amenities include: water bottle filling stations, cell phone charging stations, beach umbrella and chair concessions, and additional playground equipment. 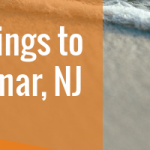 Belmar’s beaches are ranked one of the cleanest in New Jersey. The staff groom and clean the boardwalk and beaches every morning to obtain top notch cleanliness. The Belmar beaches also offer a succession of fun beach playgrounds every few blocks. Many of the beaches are dedicated to activities like kayaking, boogie boarding, and surfing. There is even a surf camp offered at 3rd Avenue Beach, where kids of all ages and abilities can take surfing lessons. For those who prefer dry activities, many of the beaches have poles installed for volleyball nets. The boardwalk in Belmar is very unique—it is made out of composite materials, and therefore there is no chance of getting splinters. The boardwalk is a great place to jog and walk, as well as people-watch or relax and enjoy the views. The boardwalk is found on Ocean Avenue, which in and of itself offers many fascinating attractions. Shops and restaurants are located along the boardwalk, as well as plentiful entertainment that runs along the extensive stretch of beach. Belmar Marina is considered one of the best marinas on the Atlantic coast. The marina is less than a half-mile from the ocean. It is a great place to dock because of its floating concrete docks and complete security services. Belmar Marina is a stone’s throw away from downtown Belmar and its plethora of restaurants and shops. The restaurants range from casual to fine dining, and everything in between. Belmar’s beautiful beaches are eight blocks away, which makes for a pleasant and short walk that goes through some of the residential neighborhoods of this charming and delightful town. The climate in Belmar, NJ is wonderful May through October, when it sees average highs from seventy to eighty degrees. November through April, the weather is cooler with average temperatures from forty to sixty degrees. In an average year Belmar, NJ sees 207 days of sun, which makes it a perfect place to enjoy the lovely small town charm of this borough. The climate here is made for walks along the boardwalk, marina and beach and enjoying the ocean views.